Located in the Brabazon Range of southeastern Alaska, Yakutat Glacier is one of the fastest retreating glaciers in the world. It is the primary outlet for the 810-square kilometer (310-square mile) Yakutat ice field, which drains into Harlequin Lake and, ultimately, the Gulf of Alaska. 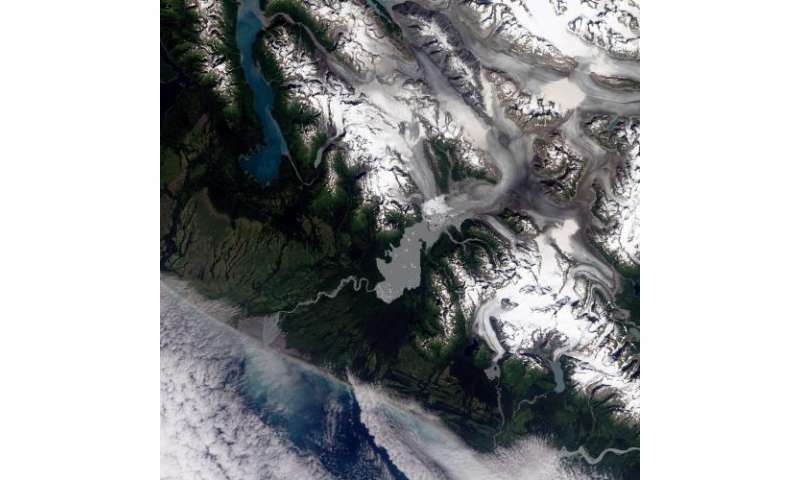 The Operational Land Imager on the Landsat 8 satellite captured this image of the glacier and lake on Aug. 13, 2013. Snow and ice appear white and forests are green. The brown streaks on the glaciers are lateral and medial moraines. Over the past 26 years, the glacier's terminus has retreated more than 5 kilometers (3 miles). What is causing the rapid retreat? University of Alaska glaciologist Martin Truffer and colleagues pointed to a number of factors in their 2013 study published in the Journal of Glaciology. The chief cause is the long-term contraction of the Yakutat Ice Field, which has been shrinking since the height of the Little Ice Age. Once part of a much larger ice field, Yakutat has been contracting for hundreds of years. As other nearby glaciers retreated, Yakutat ice field was cut off from higher-elevation areas that once supplied a steady flow of ice from the north. With that flow cut off, there simply is not enough snow falling over the low-elevation Yakutat ice field to prevent it from retreating. Beyond this natural change, human-caused global warming has hastened the speed of the retreat. Between 1948–2000, mean annual temperatures in Yakutat increased by 1.38° Celsius (2.48° Fahrenheit). Between 2000 and 2010, they rose by another 0.48°C (0.86°F). The warmer temperatures encourage melting and sublimation at all ice surfaces exposed to the air. In the past few years, the breakdown of a long, floating ice tongue has triggered especially dramatic changes in the terminus of Yakutat glacier. For many years, Yakutat's two main tributaries merged and formed a 5-kilometer (3-mile) calving face that extended far into Harlequin Lake. In the past decade, satellites observed a rapid terminus retreat and the breakup of the ice tongue in 2010. As a result, the calving front divided into two sections, with one running east-west and another running north-south. I see some genius gave this article a 1. Strange as it's merely a fact based report of the proceeding state of a glacier. Must be the mention of AGW. A denier in other words. "The average mass balance of the glaciers with available long-term observation series around the world continues to be negative, with tentative figures indicating a further thickness reduction of 0.6 metres water equivalent (m w.e.) during the hydrological year 2012. The new data continues the global trend in strong ice loss over the past few decades and brings the cumulative average thickness loss of the reference glaciers since 1980 at 16 m w.e. (see Figures 1 and 2). All so far reported mass balance values given in Table 3, are tentative."